Humorist, pizza lover, fond of science and history. Freestyle coder. 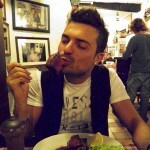 Art historian specialized in Renaissance Rome and preservation of Italian cultural heritage. 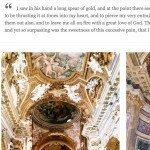 It all began with our deep-rooted love for our hometown: living here every day, we've realized how much the Eternal City is admired and visited but, in the meantime, how much of its immense cultural heritage is little known or misrepresented. We actually wished to give back to Rome the authentic attention deserved, so we began to think of a cultural project since 2011 and we launched it in 2014. We've been the first project ever to promote academic-quality cultural contents relating to Rome through advanced technologies. Besides publishing specialist articles investigating various art historical aspects of Rome, also making available the results of Italian academic research to foreign readers, we’ve launched HackRome in 2015 and a real-time map of Rome monuments and exhibitions in 2016. We know this city not only because we're Italian locals, but also because we’ve received the love for Rome as an Italian cultural bequest from our ancestors and this is the legacy we hope to pass over every curious traveler, student, scholar or art enthusiast who decide to follow with us the path of this amazing journey through history. We started off with our Intro, finding in Internet and in particular in the social media the best way to share with accuracy and authenticity a reliable knowledge of the lesser known Rome beyond any glossy semblance. 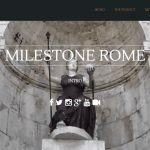 The Milestone Rome journal was born, in order to foster an off-the-beaten-path discovery of the treasures enshrined in churches and museums, the vanished stories and the hidden gems behind every corner of our city. 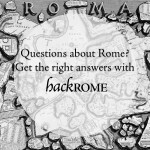 We launched HackRome to celebrate Milestone Rome's first anniversary. We launched our real-time map of Rome monuments and events, handcrafted by us and equipped with an interactive search engine.